The world of art policing has lost one of its finest. "Nel pomeriggio, in Roma, è venuto a mancare il Sig. Generale Roberto Conforti, già Cte del TPA, un signore vero ed un grandissimo dell'Arma, possa Lui riposare in pace." 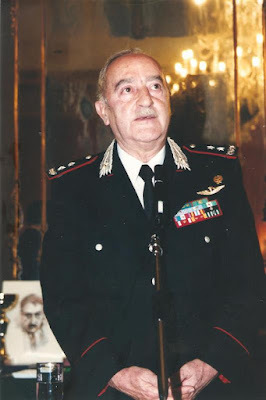 Sometimes referred to as the "General of Culture" General B(a) CC Roberto Conforti served as General of Italy's Comando Carabinieri Tutela Patrimonio Culturale, commanding the group from 1991 until September 01, 2002. Part soldier, part museum curator, sometimes tough guy and genteel art lover, his life was dedicated to the protection of Italy's artistic treasures. Respected by all, when he was first tasked to oversee the squad, the Carabinieri TPC corps counted just sixty men, responsible for the formidable task of protecting Italy's 96,500 churches and an untold number of archaeological sites, both known and unknown. The unit's growth to its present size of almost 300 officers is due in no small part to Conforti's development of the world's most famous art crime police force and its investigative prowess. Conforti was born in Southern Italy in Serre, near Salerno and enlisted in the Carabinieri when he was just nineteen. While famous today for his intensive work in the sector of art crimes, Conforti first spent an extensive period of his career working against some of Italy’s most notorious, dangerous, and impregnable criminals in Sardinia and Naples. Having cut his teeth on organized crime, he then transferred to Rome in the late 1970s, where he first oversaw an operational unit responsible for terrorism investigations involving the Red Brigades, a militant group responsible for numerous violent incidents, including assassinations, kidnapping and robberies during Italy’s so-called "Years of Lead". Conforti passed away today at the age of 79. He is survived by his wife Filomena and his children. As the officers who worked with him throughout his long career can best attest, few individuals have left such an important mark on the art crime fighting world. Generale Conforti's funeral will take place on Friday, Jul 28 at 12.00 noon at the Church of St. Ignatius of Loyola, via del Caravita n. 8/a (Rione Pigna) in Rome, flanking the Carabinieri TPC headquarters he oversaw with dedication for so many years. Resterai per sempre nei nostri cuori. Long before the news broke about a US Civil Complaint requiring forfeiture of thousands of cuneiform tablets and clay bullae, or Egypt's more recent concern about its trafficked papyrus, the Museum of the Bible's decision-making regarding who to hire and for what purpose was a bit off center. In 2015, I created a list of known persons who had identified themselves as Museum of the Bible employees using available open source data out of growing concern for their collection practices. At that time, only a limited number of the individuals had any formal museum or curatorial background, and the few that did were frequently at the nascent stage of their professional careers. 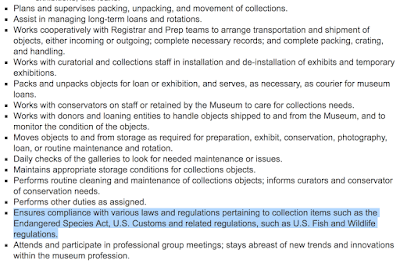 None of those I documented listed anything in their backgrounds that would have attested to having had experience in ethical collection management. Additionally, only one employee was listed as a conservator/restorer. Given the size of the future museum, and its burgeoning collection, one would assume that personnel with experience in both these important skillsets would have been required and should have been a top priority for a museum with a growing and extensive collection of objects and manuscripts. Instead, the restorer of record had no formal conservation training, and listed his university degrees as having a Bachelor’s degree in Psychology and a Bachelor’s degree in Communication Sciences and Journalism. One curator of Cuneiform tablets had no museum experience at all and listed his former posting as a Postdoctoral Researcher at the Cuneiform Digital Library Initiative. Another curator, of Medieval Manuscripts, had been a summer intern at the Smithsonian. The second job posting however was extremely specific and was not your run of the mill typical museum vacancy. It seemed the Museum of the Bible was looking for an Intelligence & Investigations Specialist, "to obtain and evaluate intelligence concerning threat information and conduct investigations into possible illegal activity against Museum of the Bible (MOTB), to ensure the security and safety of MOTB assets and interests." 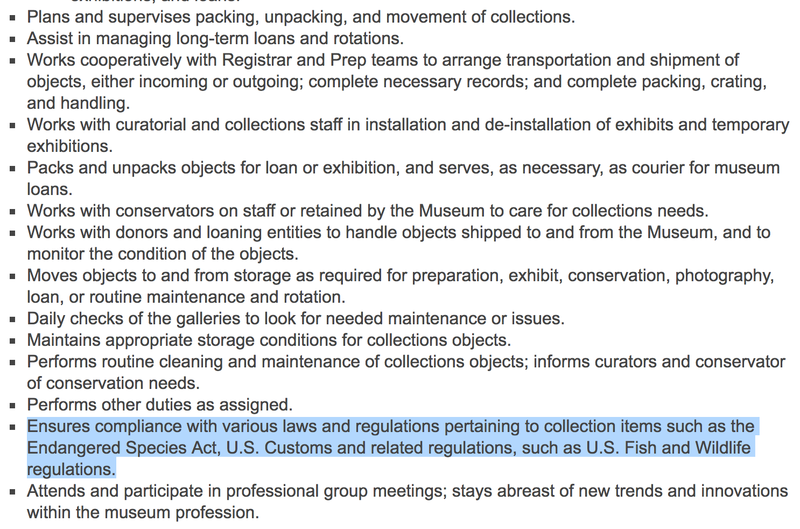 While museums and their museum security risk managers routinely look at threat levels as part of their wider risk assessments, this job description seems to be a lot more specific. Conduct predictive threat analysis to support domestic and international Executive Protection operations for VIPs, designated individuals, and MOTB staff as directed. But enough on potential new hires. Filing away those that have worked for the Museum of the Bible in the past and have subsequently left the Green's museum behind, I thought I would also try to see where former collaborator Dr. Scott Carroll has been keeping himself over the last year since parting ways with the Washington DC apologists. In April of this year he also spent a bit of time at St. Andrew's Church in Hong Kong giving some inspirational talks with some of his old friends including Josh McDowell and colleague Todd Hillard. 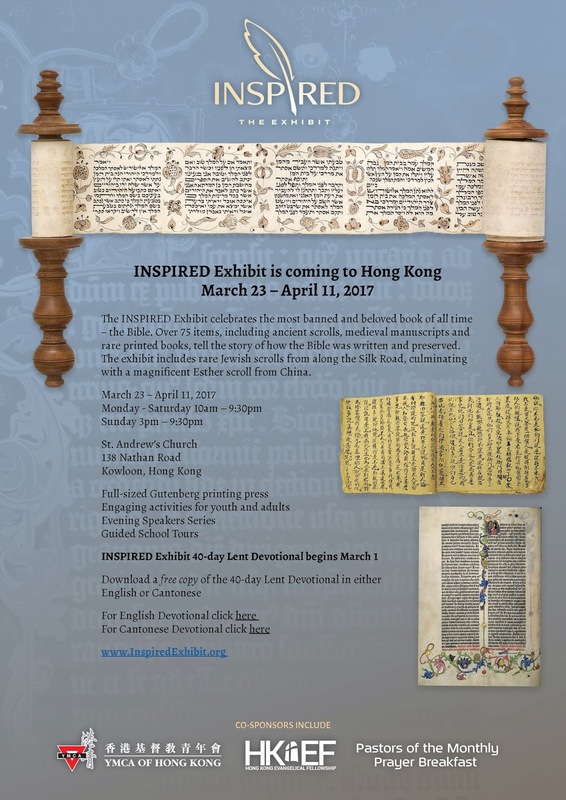 Carroll identifies himself as the CEO of the "Inspired" exhibit, a travelling showcase of religious-themed objects where attendees are "immersed in the finest collection of biblical artifacts that had ever been in the city: Papyrus fragments, cuneiform tablets, medieval manuscripts, stunning Hebrew scrolls, and some of the most important early translations of the Bible in the world." Does the melody to this song sound familiar? 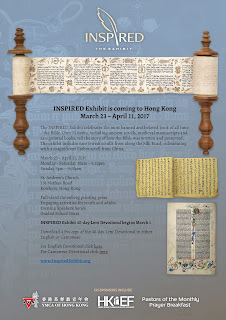 One of the objects in this travelling exhibition was this Taj Torah, purportedly produced in Yemen in the 17th century. While in Hong Kong Carroll also popped in for a dedication ceremony at Evangel Seminary, affiliated under the Evangelical Free Church of China, where a Torah scroll was being donated by Ken and Barbara Larson. 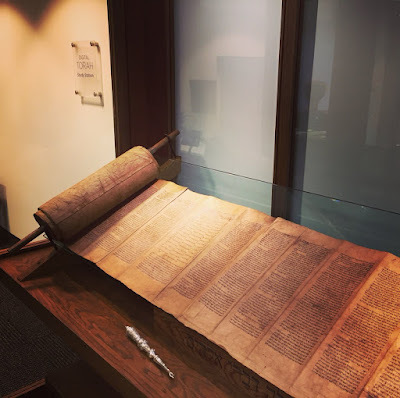 The Larsons, founders of the family-owned furniture chain Slumberland, have purchased Torah scrolls as apologetic tools for establishing the reliability of the word of God with the intention of giving many of them to evangelical seminaries. Torah's are normally retired to a Genizah, a vault, or a protected receptacle, in which holy things which are posul are kept until burial. 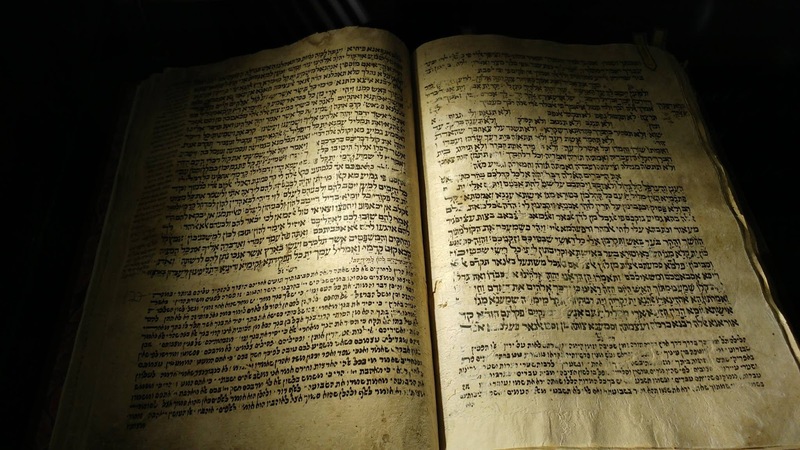 When holy objects are no longer in use as according to Jewish law, they cannot be destroyed, but should be treated with the same respect and care allotted the deceased. In 2015 Roberta Mazza had identified 7 Torah's donated by the Larson's "Gifting" ministry. 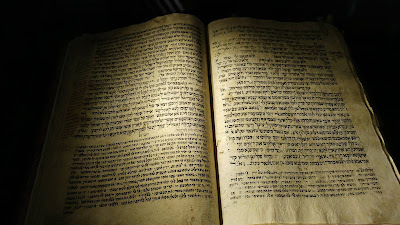 One of these, the Larson-Bethel Baghdad Torah dates predominantly to the early 17th century. According to statements in the video, the Larson's currently list their donation count at 36. Carroll's next 2017 stop was Bangkok, Thailand, where he recently concluded a teaching assignment on Bible Backgrounds and Ancient Cultures in early July. Sadly none of these religious outreach visits seemed to include any mention of the ministry of collecting ethically. Long-time antiquities dealer Hicham Aboutaam has sued the Rupert Murdoch-owned Wall Street Journal’s corporate parent Dow Jones and Company in New York County Supreme Court on Monday over an article titled “Prominent Art Family Entangled in ISIS Antiquities-Looting Investigations” which was published in the WSJ on May 31, 2017. The Journal’s reporters Benoit Faucon and Georgi Kantchev shared a byline on the article but have not been named as defendants in the lawsuit. Faucon, a Senior Report for the Wall Street Journal, has long covered issues related to OPEC and the oil industries of Iran, Libya, Nigeria and Algeria. More recently he has been working on investigative reports involving illicit trafficking, money laundering or terrorism financing. Kantchev is a London-based reporter primarily covering financial markets. 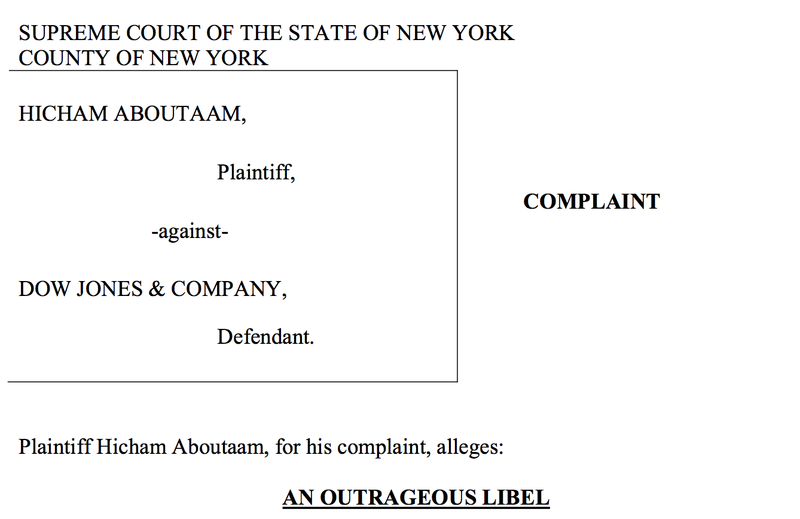 In the 30 page complaint Aboutaam demands unspecified damages on two claims of defamation. These are the five elements that a plaintiff must successfully demonstrate in most liable suits against the mass media. 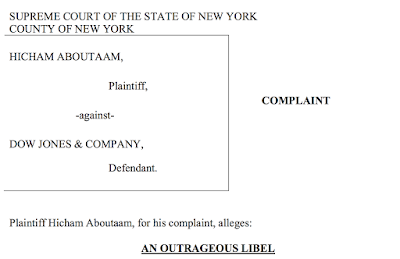 In general, under New York State Law, to recover for libel (injury to one’s reputation from a written expression), Hicham Aboutaam will need to establish five elements outlined in Celle v. Filipino Reporter Enters. Inc., 209 F.3d 163, 176 (2d Cir. 2000). (5) special damages or per se actionability (defamatory on its face). As the result of First Amendment concerns, when a defendant is a media publisher or broadcaster, a private plaintiff must establish that the media defendant “acted in a grossly irresponsible manner without due consideration for the standards of information gathering and dissemination ordinarily followed by responsible parties” (Chapadeau v Utica Observer-Dispatch, 38 NY2d 196, 199  with respect to a matter of public concern. Plaintiffs must also prove that the alleged defamatory publication refers to them. This element of a libel lawsuit often is referred to as the “of and concerning” principle. Suspect antiquities, traceable to ancient art sales through Hicham and Ali Aboutaam's companies have been written about with recurring frequency on the Association's blog. It should be remembered that Hicham Aboutaam was arrested in 2003 for smuggling a looted ceremonial drinking vessel from Iran into the US, claiming that it had come from Syria. Hicham pled guilty to the charges in 2004, paid a fine, and the vessel was returned to the Iranian authorities. Hicham Aboutaam stated that his conviction stemmed from a "lapse in judgment." In the past, the Egyptian authorities accused Ali Aboutaam of involvement with Tarek El-Suesy (al-Seweissi), who was arrested in 2003 under Egypt’s patrimony law for illegal export of antiquities. Ali Aboutaam was tried in absentia, pronounced guilty and was fined, and sentenced to 15 years in prison in the Egyptian court in April 2004. To date, he has not served any of the Egyptian sentence. Perhaps the brothers might wish to consider which of the aforementioned elements, an article by the Wall Street Journal or engaging in suspect trading practices, has the greater potential for damaging their reputation. Recipe for a museum theft: 5 seized vehicles, 4 shotguns, a six-figure sum of money, and a pinch of organized crime. When a giant gold coin, weighing 100 kilos was stolen from the Bode Museum in the early morning hours of March 27, 2017 it was pretty obvious that there might be insider involvement. Even if the group of burglars had entered the Berlin museum through a forced window, evading the prestigious museum's alarm system, hacking their way through the exhibit's attack-proof glass case and then carting the heavy coin away in a wheelbarrow. But this week's raids, carried out by authorities in Neukölln, Berlin’s most impoverished district, turned up an interesting wrinkle; three of the four men taken into custody, Abdel R. (18), Ahmed R. (19), and Wissam R. (20) appear to have ties to a Middle Eastern crime syndicate referred to as the “R. family*. The fourth suspect, Dennis W. was German and had just gotten a subcontracting job at the Bode Museum as a supervisor shortly before the robbery. Nine others, individuals, older members of the same “R” clan, are also under investigation with the German authorities. These are grandfamilies of Lebanese-Kurdish descent who immigrated to Germany during Lebanon's 1975-1990 civil war. Many moved to immigrant neighborhoods like those in Kreuzberg, Wedding, and Neukölln where this week's raids took place. Some of these families originate with the Mhallami community, a tightly-knit group of families with origins in the Mardin Province of Southeastern Turkey who had previously lived in Beirut, Tripoli, and the Beqaa Valley in Lebanon. Members of several of these families have been criminally conspicuous, gaining reputations for trafficking, racketeering and robbery, some of which have been spectacular in their execution. While searching 20 apartments and making yesterday's arrests, authorities seized four firearms, five vehicles and "a low six-figure sum" in cash. Given that all four of the arrested co-conspirators are under 21 years old, the case will be tried in the regional Jugendstrafkammer, Germany's regional youth criminal court. "address all alternative sources of financing of terrorism, including dismantling connections, where they exist, between terrorism and transnational organized crime, such as the diversion of weapons including weapons of mass destruction, looting and smuggling of antiquities, kidnapping for ransom, drugs and human trafficking." If adopted by the EU's 28 member nations and by the European Parliament, the measures would enter into force in 2019. --goods such as artwork, collections, and antiques. A licensing system for the import of these object classes which would require importers to have obtained import licences from the competent authorities in the EU before importing objects into the EU. Applying a more rigorous certification system by submitting a signed statement or affidavit as proof that the goods have been exported legally from the third country. 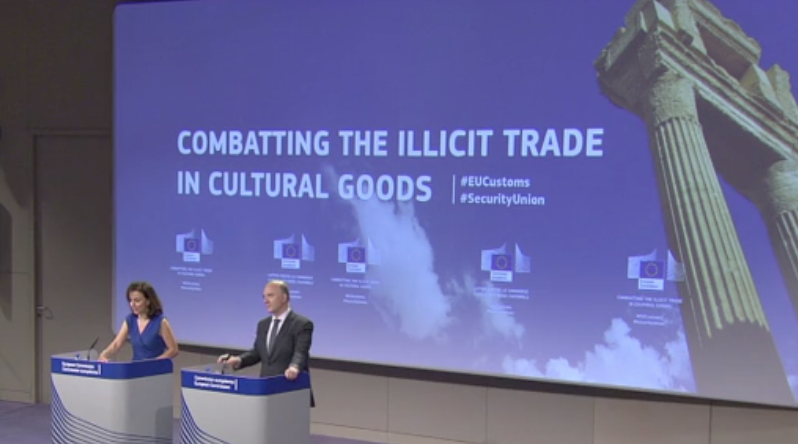 Customs authorities having the power to seize and retain goods when it cannot be demonstrated that the cultural goods in question have been legally exported. Increasing public awareness, specifically targeting those who both trade in and purchase cultural goods as their personal or economically driven desire to own ancient art, frequently fails to put emphasis on an object’s origins or legality during the purchasing decision making process. All this sounds good in concept, but implementing future regulations and then enforcing them is another thing. New Regulations, but the ability to inforce them? According to 2016 annual trade data on art and antiques, sales at auction and through private sales and by art and antique dealers for classical antiquities in Europe were estimated at $66.7 million, larger than the U.S. market ($51.56 million). In contrast Belgium's federal police unit dedicated to fighting illegal trafficking of cultural property, once part of the central directorate against serious and organised crime, made up of five persons in 2006, was reduced to two investigators and then quietly eliminated in 2016. Per a recent email in London, a city where one of the Europe's busiest antiquities art markets resides, the city's Art & Antiques Unit of SCO7, with the Metropolitan Police has been operationally suspended since June 19, 2017 in light of the recent incidents in London. The unit's automated email reply states the unit has been redeployed for three months and they are therefore unable to accept any new enquiries at this time, adding "we hope to be back in the Autumn." 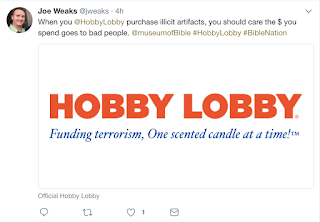 As the US press and social media came alive in condemnation as a result of the Hobby Lobby smuggling case, I couldn't help but notice that while the hashtag #HobbyLobbyisISIS is noticeably attention-grabbing, (as well as probably inaccurate), the more important facet of the "is-that-object-looted" puzzle was still being overlooked. I asked myself, instead of simply rewording the press release announcement released by the government, why hadn't US news organizations dug deeper into the development of the Green Collection in ancient art. Especially since everyone now seems hellbent, (excuse the pun) on crucifying the fundamentalist Christian collector or finding some way to tie Hobby Lobby to Da'esh. This is a case that has been widely publicized since 2015, and it's not the only time the Greens or their large collection have come under scrutiny or been accused of acquiring objects through untrustworthy channels with illicit ties. In June 2014 Dr. David Trobisch, Director of Collections for the Museum of the Bible even attended ARCA’s annual art crime conference where he heard concerns made by Dr. Roberta Mazza, a papyrologist and ancient historian from the University of Manchester about the Green Collection's unprovenanced papyrus fragments. Those fragments however were not mentioned in this current civil complaint. While this US civil forfeiture case underscores that illicit traffic in cultural objects contributes to the despoliation of a country's ancient heritage and causes irreparable loss to the world's heritage knowledge, why is it then that the public only wakes up and takes notice when ISIS ties are tangentially inferred? Are trafficked Middle East artifacts only worthy of the world's indignation when they are looted to fund terrorism? As the general public responded to the press coverage over the last two days most of the grumbling I've come across was either ISIS-funding related or centered on whether or not the punishment fit the crime. I use the word "crime" here loosely because no criminal charges were filed for the looting and theft of the 450 ancient cuneiform tablets and 3,000 ancient clay bullae which ultimately were the subject of this civil forfeiture. In civil cases, the object of the law is the redress of wrongs by compelling compensation or restitution. As those following this case closely are painfully aware, civil law deals with the disputes between individuals, organizations, or between the two, in which compensation can be awarded to the victim. Criminal law is the body of law that deals with crime and the legal punishment of criminal offenses. A civil fine is not a criminal punishment. Civil case fines are primarily sought in federal investigations in order to compensate the state for harm done to it, rather than to punish a wrongful conduct, something many like myself would have liked to have seen happen given the Green's less than stellar record when it comes to vetting antiquities for inclusion in their collection. In this case, Hobby Lobby only suffers so much harm as is necessary to make good the wrong they have done (to the state). Civil penalties, in this case a $3M fine, do not carry any jail time or other legal penalties. This fact illustrates why no one from Hobby Lobby was criminally charged, despite the large number of objects seized and subsequently forfeited. This may also explain the absence of any noticeable public remorse on Hobby Lobby's part for their role in this antiquities smuggling affair. The lack of regret can also be seen in the unrepentant statement by Hobby Lobby President Steve Green, in his company's press release after the federal civil ruling was publicized. "The Company was new to the world of acquiring these items, and did not fully appreciate the complexities of the acquisitions process. This resulted in some regrettable mistakes. The Company imprudently relied on dealers and shippers who, in hindsight, did not understand the correct way to document and ship these items." Was new to the world of acquiring these items? Did not understand the correct way to document and ship these items? Let's look at his statements more closely. While Hobby Lobby, may be "new" to the world of acquiring antiquities, the fact that it has purchased more than 40,000 objects since November 2009 does not in any way make it a neophyte collector of ancient art. 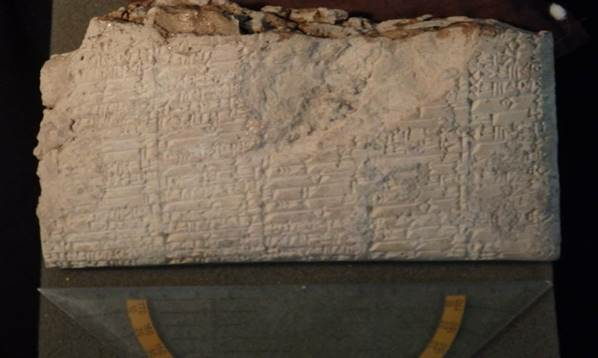 In addition to the cuneiform tablets seized in this well publicized case, the Green Collection already had in its possession the third largest holding of cuneiform tablets in North America (over 10,000 pieces). This means Green and Hobby Lobby by proxy had ample prior opportunity to explore what could and should go on any customs declaration for objects that contain writing first developed by the ancient Sumerians of Mesopotamia between 3500-3000 BCE. In 2010, a year before the seized cuneiform tablets arrived in Memphis, the Greens had also already consulted with Dr. Patty Gerstenblith, a cultural heritage law expert with DePaul University 's College of Law, about import restrictions for ancient antiquities who is reported to have advised them about their need for deeper due diligence in their collecting. Given Gerstenblith's impeccable familiarity with the cultural heritage law, it can be assumed that the Greens as collectors were not as ignorantly naive to the road they were embarking down as the firm's press statement this week seems to imply. 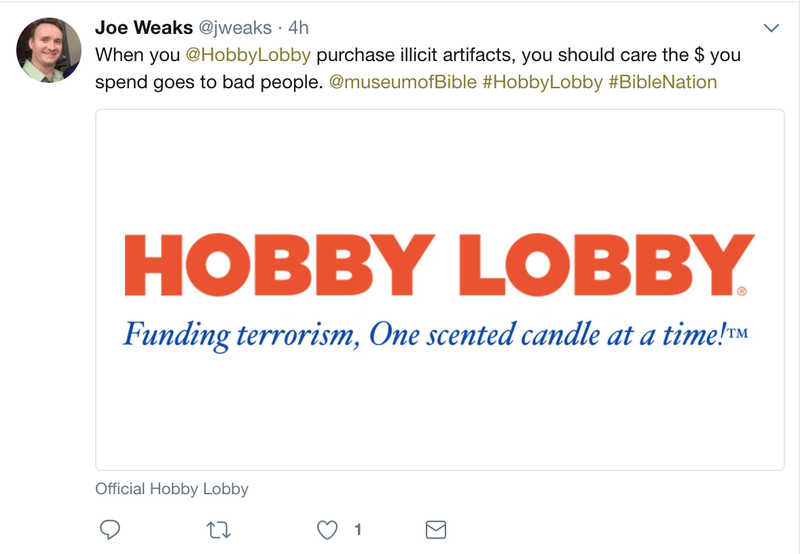 But setting aside the intricacies of import and customs documentation specifically related to ancient antiquities coming from Iraq, Hobby Lobby itself has some 32,000 employees, 750 stores in forty-seven states, and $4 billion in yearly revenue, much of it based on imported items. It's corporate headquarters include a 9.2 million-square-foot manufacturing, distribution, and office complex in Oklahoma City. Its warehouse has an hourly employee base of 2500+ employees with 80+ members of management, headed by an Assistant Vice President of Warehouse Operations, who reports to the Senior Vice President of Distribution. When importing merchandise from foreign countries Hobby Lobby is fully aware there are certain trade laws and regulations, and that U.S. Customs oversees the compliance of those laws. They even have an international department responsible for training and compliance to ensure the import process go smoothly, not to mention a manual outlining laws and regulations, valuation, assists, and country of origin requirements which can be downloaded here. So to imply to the public that Hobby Lobby "imprudently relied on dealers and shippers who, in hindsight, did not understand the correct way to document and ship these items" seems a bit unapologetic coming from an apologist. Especially given Green's business thrives on supply-chain distribution members in its shipping department who would have to have, given the large scale operation of receiving imported cargo from across the globe in support of Hobby Lobby's national operations, sufficient knowledge of what the legal requirements are for import. If they didn't, they certainly knew who to ask. As I have mentioned in a previous post, the estimated 40,000+ objects in the Green Collection equates to acquiring 6,666 objects per year or collecting a whopping 18 new objects per day. Compare that acquisition rate to the number of employees working on the Green's or the Museum of the Bible's payroll who are tasked with historic object provenance and one can easily surmise that an object's ethical collection history has never been either group's overriding priority. Emphasis instead has been on filling the Museum of the Bible, Washington DC's about-to-be-opened 430,000-square-foot, eight story massive red brick museum located over the Federal Center SW Metro station. To put that into perspective, one NFL football field is 57,600 square feet. The Museum of the Bible has seven and a half football fields of space it needs to fill. Given the scale of archaeological theft in biblical area source countries and the number of objects with questionable origins which have already been identified by various researchers following the Green Collection prior to this forfeiture, it's time for Hobby Lobby's founders to do more than just open their wallets, purchase, and if caught, pay civil fines and forfeit the objects in question. Opening their wallets has been the crux of the problem, as the Green's appetite for unprovenanced antiquities, and the profits to be had from this appetite, have likely been a motivating factor for others to loot, thereby destroying whatever context the objects may have had. It's time for the Greens to fulfill the promise previously made by their employee. In 2014 the director of Collections at the Museum of the Bible, David Trobisch, informed Dr. Roberta Mazza that the Green Collection was going towards full digitisation and open access. This has yet to happen. They should also make every effort, before making any further acquisitions, to ensure that the objects they are purchasing have been legally obtained and been legally exported from their country of origin. If the Greens truly want to make amends, they should fill their future Museum of the Bible with acquisitions collected ethically, and make the details of their past purchases open to researchers and investigators so that they can start to set things right by restituting any objects previously purchased without sufficient moral and ethical consideration. I think that includes cuneiform tablets, clay bullae, incantation bowls and papyrus fragments. Civil Complaint requires forfeiture of thousands of cuneiform tablets and clay bullae, but is that enough? On July 5, 2017, one year and eight months after news broke that Hobby Lobby Stores, Inc., the world's largest privately owned arts and crafts retailer, and two of its corporate affiliates were under federal investigation for the illicit importation of cultural heritage from Iraq, the United States Department of Justice has issued a formal press release statement on the resolution of the case and the Department of Justice's Civil Complaint. At the heart of the investigation, were import irregularities related to ancient artifacts shipped to Hobby Lobby, Mardel, Inc. and Crafts, Etc! The firms Mardel, Inc. and Crafts, Etc! were affiliates of Hobby Lobby and both maintained their principal corporate offices adjacent to Hobby Lobby’s headquarters in Oklahoma City. The antiquities were shipped to Hobby Lobby and their associates by dealers in Israel and the United Arab Emirates (“UAE”), all of whom have been left unnamed in the civil complaint. The objects were shipped without required customs entry documentation being filed with the U.S. Customs and Border Protection (CBP) and bore shipping labels that falsely and misleadingly described their contents and their value, in some cases as “ceramic tiles” or “clay tiles (sample).” In truth, the mislabeled objects were ancient clay and stone artifacts that originate from the area of modern day Iraq, which had been smuggled into the United States after their contracted purchase in the Middle East. 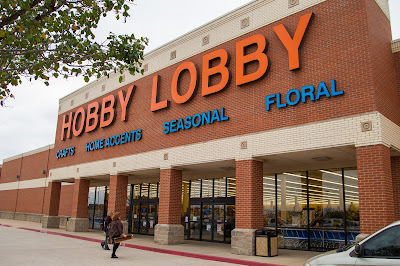 Hobby Lobby's growing Green Collection is purported to be the largest private collection of rare biblical texts and artifacts worldwide and is estimated to be made up of more than 40,000 biblical-related antiquities, purchased and assembled by the Green family, who are founders of the national arts and crafts chain. The bulk of this collection is intended to be displayed in their 430,000-square-foot Museum of the Bible, which is scheduled to open in Washington DC in November of 2017. As is often the case with illicit antiquities smuggled around the globe, the intercepted packages, destined eventually to join the museum's collection, had their shipping labels intentionally mislabeled, stating the country of origin as imports from Turkey and Israel, not Iraq. The shippers also used multiple shipping addresses for objects destined for a single recipient. This too is a technique used by smugglers of all types, not just illicit antiquities, as it is a means of avoiding scrutiny by customs authorities. In the DOJ press release Bridget M. Rohde, Acting United States Attorney for the Eastern District of New York, and Karin Orenstein, Assistant United States Attorney, of counsel, announced that Hobby Lobby Stores has agreed to pay a $3 million federal fine and forfeit thousands of ancient Iraqi artifacts believed to have been smuggled in 15 shipments, 5 of which were stopped by the CBP on their way to the Greens. Hobby Lobby had executed an agreement to purchase the objects, despite their likely illicit origins, in 2010 for $1.6 million. They paid for the antiquities via wire payments to seven personal bank accounts held in the names of five individuals. This despite noticeable suspicious irregularities in the objects purported provenance and no direct contact with the objects' "owner. The civil complaint also outlines conversations related to the purchase and import which indicate intentional changes to invoices and shipment to disguise the objects' value, and in some cases to change to purported seller. Legal measures specific to Iraq also make it a violation of U.S. law to import any cultural objects removed from Iraq since August 1990, unless exported with the permission of Iraqi authorities. Illegally importing objects that meet this criteria are subject to criminal penalties and fines. immovable, on or under the ground, are considered property of the state. Under Article 16 of Antiquities Law No. 59, private persons generally cannot possess antiquities. Article 26 of the same antiquities law prohibits the export of Iraqi antiquities and defines “antiquities” as movable possessions which were made, produced, sculpted, written or drawn by man and which are at least 200 years old. Southern Mesopotamian objects definitely fall into this category as any collections management expert in Near East antiquity would be aware of. Is a $3 million fine and the forfeiture of 450 ancient cuneiform tablets and 3,000 ancient clay bullae enough? As a result of this investigation, Hobby Lobby has agreed to adopt internal policies and procedures governing its importation and purchase of cultural property, provide appropriate training to its personnel, hire qualified outside customs counsel and customs brokers, and submit quarterly reports to the government on any cultural property acquisitions for the next eighteen months. In a statement, Hobby Lobby President Steve Green, who serves as chairman of the board of the Museum of the Bible, said the company "was new to the world of acquiring these items, and did not fully appreciate the complexities of the acquisitions process. This resulted in some regrettable mistakes. The Company imprudently relied on dealers and shippers who, in hindsight, did not understand the correct way to document and ship these items." NB: No one has faced criminal prosecution (read: jail time) for their actions. Last weekend ARCA held its yearly conference in the beautiful town of Amelia, seat of its Postgraduate Certificate Program in Art Crime and Cultural Heritage Protection. With a record number of attendees from international organizations, law enforcement agencies, academics, cultural institutions, and private sector professionals in the art and antiquities fields – the conference, in its 8th year offered a unique meeting point for those interested in art related crimes. The first panel brought a number of new perspectives on fakes and forgeries. Mustafa Ergül, a librarian and archivist at SALT in Istanbul, Turkey, offered an overview of painting forgery in Turkish art scene since the 1990s, and the cultural, economic and legal aspects around it. Judith Harris, an American freelance journalist working in Italy, continued and initiated the audience into the con acts of of Christian Parisot, convicted in Italy as well as in France of fraudulent authentications of Modigliani works. Liliana Wuffli, from the University of Lausanne, pointed at the lack of resources aimed at fakes and forgeries and discussed her research project that seeks to build a tool to prevent fakes and forgeries from entering the market. Finally, Andrea Borroni, a professor at the Università degli Studi di Napoli Federico II, discussed the seemingly legal quagmire that comes from mistakes in attributions, like for example, this event which occurred this year when specialists at the Herzog Anton Ulrich Museum discovered that the painting, The Braunschweig Terrier, attributed for more than 250 years to a little known German painter, had actually been authored by Rembrandt. While the destruction and smuggling of cultural heritage from war zones usually only comes to us through the general media, this year’s conference included a unique panel with experts from Syria and Iraq and Bosnia & Herzogovina. Maamoun Abdulkarim, of the Directorate-General for Antiquities and Museums (DGAM), provided his first-hand look at the fight against trafficking in antiquities in Syria. Samer Abdel Ghafour, founder of ArchaeologyIN, continued this discourse on looted Syrian antiquities with a further analysis of a specific case of trafficking in the country before the start of the present conflict and his organization's role in identifying the object and notifying the authorities as to its trafficking. Layla Salih, from the Iraqi State Board of Antiquities and Heritage at the Ministry of Culture in Iraq (SBAH), followed with an overview of the realities on the ground in Northern Iraq, especially in territories once occupied by Da'esh. Finally, Dženan Jusufović and Senad Begović from the Centar Protiv Krijumčarenja Umjetninama (CPKU) in Bosnia and Herzegovina, discussed their country's impediments in fighting trafficking in art. This panel also highlighted ARCA's Minerva Scholarship, which allows scholars from conflict countries to study with the Association's postgraduate program each year. In this panel, some innovative new approaches were presented to counter illicit trafficking. Vijay Kumar, founder of the India Pride Project, explained how the project aims to bring India’s cultural treasures home by leveraging the power of social media – a grassroots movement that pushes for restitution with impressive results so far. Sam Hardy, Honorary Research Associate with the Institute of Archaeology, University College London, followed with a presentation on metal detecting and its impact on portable antiquities find sites. Finally, Jessica Kamphuis, graduate of ARCA’s 2015 program, drew an interesting comparison between the trafficking cultural heritage and endangered species from the perspective of border security. Captain Rapicavoli from the Comando Carabinieri Tutela Patrimonio Culturale, Italy's Art and Antiquities Squad elaborated on the online market in illicit art and the way the Italian Art Squad deals with this new challenge. Next was Martin Finkelnberg, head of the Art and Antique Crime Unit, National Criminal Intelligence Division at the National Police of the Netherlands spoke on the one day law enforcement plenary, which stressed the the need for dedicated public prosecutors for art-related criminal investigations and prosecutions and emphasized that under present constraints, often the focus in law enforcement is on the recovery of stolen and plundered works of art, and after that on trying to catch and or convict the related perpetrators. Finkelnberg also pointed out the complications of the enormous diversity of legislation in Europe in combatting art crimes. Lastly he reminded attendees that analytical estimates on how much money ISIS is making on plundered antiquities as a means of financing terrorism is based on very limited evidence and base assumptions, though there is evidence that ISIS does tax antiquities and excavating. Saturdays session concluded with Steve Cook, co-founder of Tagsmart, explaining how advances in nano-technology, applied to artworks as an identifier, along with a unique code which links directly to the artwork’s online record has proven successful and effective in authenticating artworks and deterring art crime. In this panel Katharina Stoll, a Senior Consultant with Protiviti GmbH, explained how specific anti-money laundering (AML) and Know Your Customer (KYC) procedures, the process of a business identifying and verifying the identity of its clients as a preventative measure necessary to monitor for money laundering, could also be applied when vetting art market actors. She applied her experience in AML cases and practices to bridge the academic and art market dialogue on this topic. The author of this blogpost, an independent writer and consultant from Amsterdam, continued with a presentation on the MOSE Project in Venice, a multi-billion euro project, which has been plagued by corruption, that may not be able to protect Venice from flooding and could potentially be an art crime in the making. Ownership History - Asset or Liability for the Art Market? Through a selection of case studies of organisations participating at TEFAF Maastricht 2017, Gareth Fletcher, from Sotheby’s Institute of Art, presented a comparative analysis of provenance information provided for objects for sale and the relationships between its dissemination, complexity and the market performance of the objects. Yagna Yass-Alston, an independent researcher on the plunder and destruction of Jewish Collections in Poland during the WWII followed with the remarkable history of paintings from the collection of Leon Holzer, Kraków, lost in wartime between 1939 and 1945. Finally, Marc Masurovsky, acting director of the ERR project, spoke to the audience about one of the most unusual art thefts of World War II from the Führerbau - translated as "the Führer's building", Adolf Hitler's administrative building on Arcisstraße in Munich. some 650 paintings on April 29, 1945, of which, 70 years later, only a few have been located. Lucia Patrizio Gunning, a teaching fellow at the Department of History at the University College London, started this panel with a discussion of past perspectives on collecting in the Near East, examining the circumstances that allowed western museums and collectors to amass Assyrian, Greek and Egyptian antiquities, the motives that brought the nations, museums and individuals to the area, the means by which they were able to excavate and remove archaeological finds, and the outcomes of their activities on the personal and institutional level. Giovanna Carugno, Ph.D., Candidate at the University of Campania Luigi Vanvitelli, and tutor at the Università degli Studi di Napoli Federico II elaborated on the evolution of EU legislation, beginning from the Treaty of Rome through the new Directive 2014/60/EU relating to the return of cultural objects unlawfully removed from the territory of a Member State. Finally, Marco Seghesio, from the University of Milan, discussed the destruction of cultural property as a war crime, using the Ahmad al-Faqi al-Mahdi case as example. Jamie Perry from the US Department of Justice, outlined the investigatory, prosecutive and police work of the Human Rights Special Prosecutions Section. After that, Dorit Straus, of Art and Insurance Advisory Services, spoke about the Cultural Property Advisory Committee (CPAC) of the US Department of State, Bureau of Educational and Cultural Affairs (ECA) which was established by Section 306 of the 1983 Convention on Cultural Property Implementation Act to advise the president (or his designee) on appropriate U.S. action in response to requests from State Parties for assistance in protecting their cultural heritage, pursuant to Article 9 of the 1970 UNESCO Convention. Lastly, the day was concluded with a presentation by Aparna Tandon, risk management and emergency recovery expert at ICCROM, who focused her talk on the organization's international capacity development programme on disaster risk management and its evacuation of heritage collections in case of emergencies. The conference weekend concluded Sunday afternoon and over the next few days attendees made their way homeward. Those already looking forward to next years conference can mark their calendars for the weekend of June 22-24, 2018. We thank the organization for this unique gathering of experts from all over the world in the tranquil and inspiring environment of Amelia.